Select offers a wide range of high attenuation fabric RF shielding solutions custom engineered to solve our client’s unique problems. Our engineering staff will collaborate with your team to fully understand your application and design a solution to your specifications. Select has solved a number of shielding needs for the automotive industry. Select designed and fabricated RF pouches for automotive key fobs to prevent car jacking and secure smart keys for dealer lock-boxes. Select also engineered a 20′ high x 30′ x45′ RF shielding tent for the testing of sensitive electronics on military vehicles. 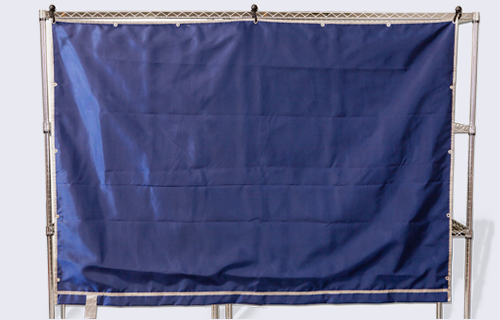 Select’s shielded curtains have been used for RFID isolation. Select can provide RF shielding for operator protection from high powered wireless transmission equipment or other RF sources. Select has worked with Medical Instrument companies to provide shielding to assure measurement accuracy. Select has also worked with wireless device manufacturers to investigate shielding solutions for RF emissions on the assembly line. Select can use Nova Select ™ fabric, made in the USA with conductive silver / copper/ nickel RoHS compliant material. This fabric has average shielding effectiveness of -85 dB in the range of 30 MHz to 1 GHz……and averages -80 dB in the 1GHz to 11GHz range. Select’s engineering staff will work with your team to contain signal leakage. Projects have included vestibule entryways, Select’s exclusive patented and patent pending door systems, and RF shielded flooring. Select Fabricators employs high performance power & data filtering and complete shielded ventilation systems. We can provide shielding effectiveness certification by an independent test lab. We can utilize collapsible frames with storage and transit systems to ensure portability. Select assures ease of use with complete installation instructions.